I've created a quick and easy gift box for Halloween using the "Trick or Treat" stamp from the Halloween Wicked Collection, a must have set for the upcoming spooky holiday! 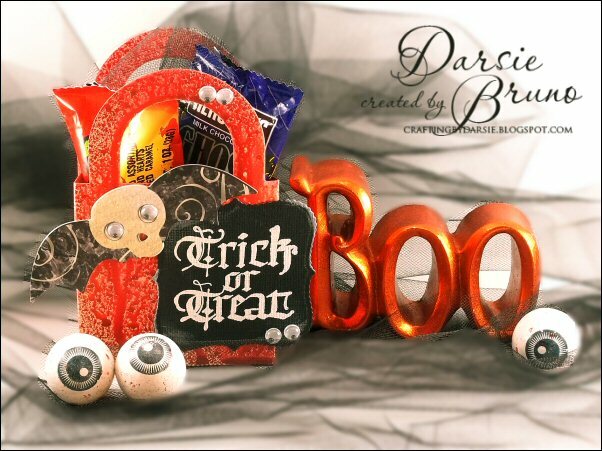 This set has all the stamps you need to make wickedly fabulous Halloween cards for those you love!! My project is made from a box I picked up in the wedding section at the dollar store. You know, the kind that you use for wedding favors? Easy to put together and decorate! I sprayed my box with Clearsnap Smooch Red Spritz and let it drip down the sides to resemble blood. 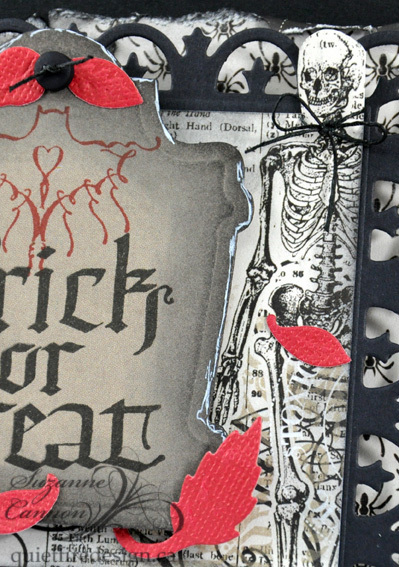 Next, I stamped "Trick or Treat" with Versamark and embossed with white embossing powder, then cut it out with Spellbinders Paper Arts™ Labels One Scalloped and adhered it to my box. I added a funky skeleton bat from the K&Company Brenda Walton Haunted Chipbox and topped it off with fun googly eyes! Lastly, I stuffed it with Ghost Chocolate, Zombie Food and Eyeball Gum! Hi Everyone! This is Holly with a garden card. We are having a glorious late summer/early fall here in BC and the bees still buzzing around inspired this card. I love the Garden Delights stamp set as well so it's easy to create with such great tools. 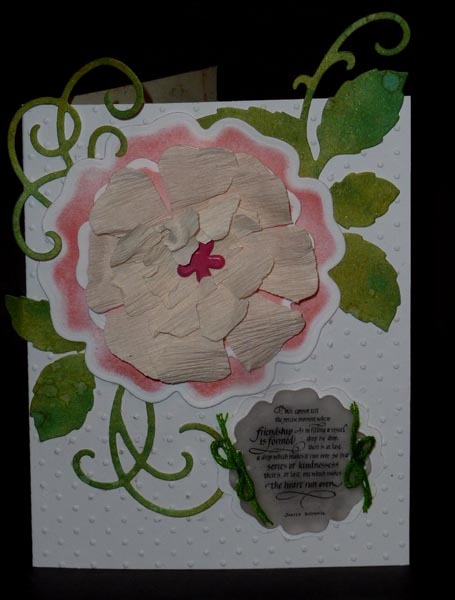 I began with Prima Marketing Nature Garden Collection paper, using one piece under the fancy lattice die cut and another piece cut into strips to 'bookend' the card front. 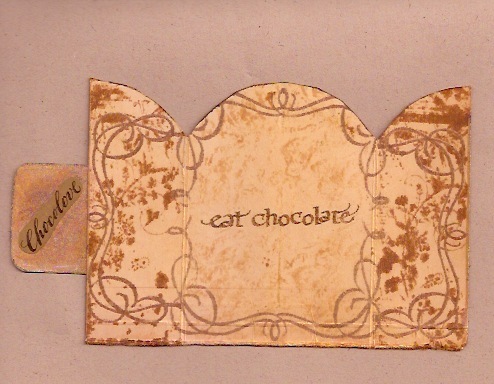 The strip was cut with the Classic Triple Scallop and sponged with Victorian Velvet distress ink. I used black Stazon ink to stamp the sentiment on white card stock and the bee onto the button. The sentiment piece was cut out using the second die from the Romantic Rectangles set. Three die cuts using the Macarena die were sponged with Peeled Paint distress ink, then one was cut in half and glued to the center of each die cut. The flower was made from another piece of paper from the same pad but having blue tones. I cut two circles using the second die of the Splendid Circles set. Each circle was then folded straight across the center, between every scallop. Cut along one fold just to the center of each circle. Then each piece is fan folded and the cut edges are glued together. The resulting flower is glued to a circle of card stock to keep it flat and stable. Once all the components were put together, the brown 1/4" circle was glued to the center of the flower, then covered with Diamond Glaze which, once dry, resembles a brad. It's a faux brad. Scattered Straw and Vintage Photo distress inks were sponged on here and there before assembly, and that's my "It's still summer!" and I am in denial card. Hope you enjoy it and thanks for looking! Hi Y'all, Monica here today. 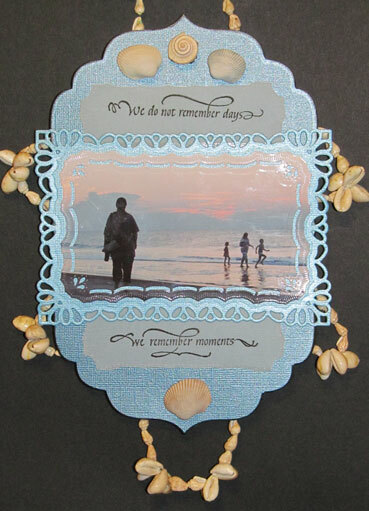 I love the saying used in this wall hanging, "We do not remember days, We remember moments." Words close to my heart. My husband often works jobs at the coast or close enough for easy visits; meanwhile I'm here at home in the mountains. We've been saying for years we need to take a vacation to the beach. In July David got a job close to home and a couple of weeks later he called me on Friday at lunch and said "Let's just stop trying to plan a trip and just go." So we made a quick trip to Tybee Island, Savannah, GA. The picture used in this wall hanging was taken after dinner Saturday evening. There was a thunderstorm inland that was creating some beautiful colors in the sunset. Right after this shot was taken there were two rainbows visible in one area and another further off to the right. Beautiful memory of that moment. The saying was cut apart and stamped on pieces of vellum with Brilliance Graphite Black ink. I used Spellbinders Resplendent Rectangles and Grand Labels Four to cut the layers. Cardstock is Bazzill Bling, medium and dark blue. The sheen of the cardstock makes getting a good picture beyond my capabilities. Trust me, the colors are much deeper and prettier than this picture shows. The shells were attached with stacked pop-dots. The shell necklace is a treasure from our past, a trinket David bought me at a boardwalk fair at Balboa Island, Newport, CA, shortly after we met in 1976. Moments! It took some digging to find this but I think it really ties things together. Goodness, has it really been 36 years?!! Hello Crafty Peeps...Terre here with a mixed media album full of Quietfire Design amazing stamps. So grab a cup of coffee, put your feet up and enjoy each page as it turn (well as you scroll down to view it anyway). This page has The Origin of Love stamp, it was perfect for what this page was saying to me. This page just screams how important love, family and just being who you are so I used Love Lives Here and Sometimes Said Pooh stamps as they say it all. Everyone feels blue from time to time and I just love this stamp that I used on this page as I personally have had to be a very strong person and pull from deep within myself when my oldest daughter found out she had cancer, you never know how strong you are until you have to be. This stamps has so much meaning to me You Never Know How Strong You Are. This page reminds me of my little four year old Leahandra, I smile so much from her humor, innocence and just being who she is so If I Had A Star For Every Time just make me smile! This page is fun and flirty....just like this amazing stamp A Smile That You Send Out, isn't that just the perfect stamp? This page makes me think of my mom, it has been over two years since I have been home and I miss my mom dearly and this stamps is soooo true A Mother Is She is just a perfect stamp that says it all when it comes to a mom. Have you ever been in line at a Starbucks and just randomly bought the person behind you a cup of coffee, I have done this little act of kindness from time to time and the smile on that persons face was worth so much, so No Act Of Kindness is the perfect stamp. I hope that one day my children will tell me that the greatest thing that I could leave them is the memories we have shared and the things that I have taught them, as riches isn't everything just like this stamps says You May Not Be Able To Leave Your Children it is the memories that last a lifetime. Robyn here, with sticky fingers! Love, love, love this set of stamps. Here is my ATC take on them. 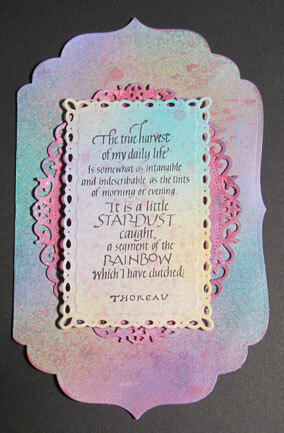 The quote is thermal embossed on top of Picket Fence Distress stain with Versafine Sepia ink. I had to eat two chocolate bars to get the collage material! I made a plastic template for this card cause I liked it so much. 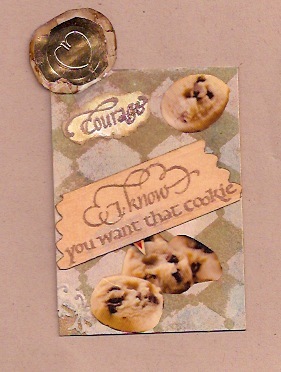 This card has a flap over the cookie that opens to say courage- to eat or not to eat, I'll leave that up to you! Only one bag of mini chocolate chips died for these cards! The tag for the quote started as a Spellbinders Ribbon Tag Trio , then I took a bite( LOL) out of it to make it fit. 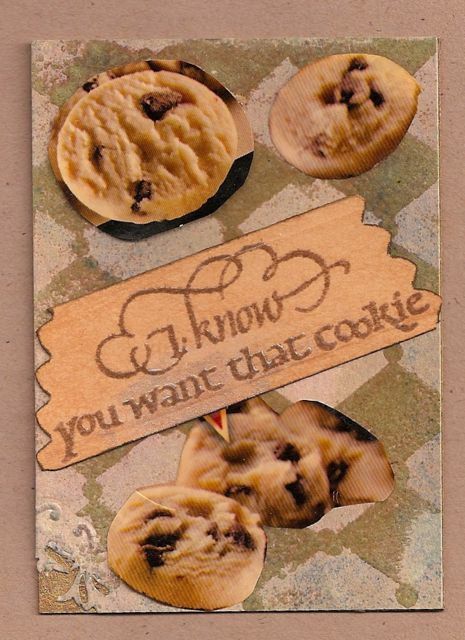 Enjoy your cravings for chocolate cookies and new stamps! The most unhealthy thing to eat is guilt! Comments and questions always welcomed! Clicking on products below takes you to Quietfire Design Store! Hello! Sherry here with a Halloween project for you today. 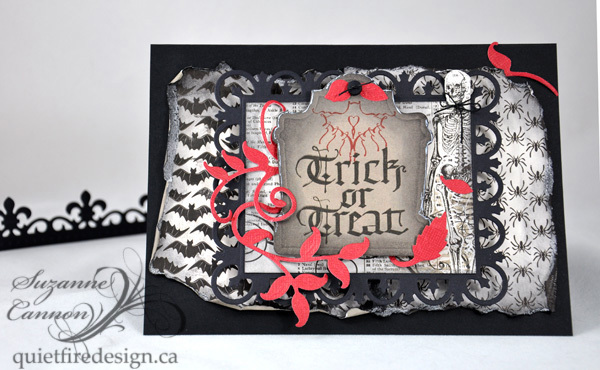 I started with the Halloween Wicked Collection and some Spellbinders Die Templates. You can find all the Quietfire Halloween items located in one convenient location here! I had this idea for a shrine, but also wanted to make my own in the process. 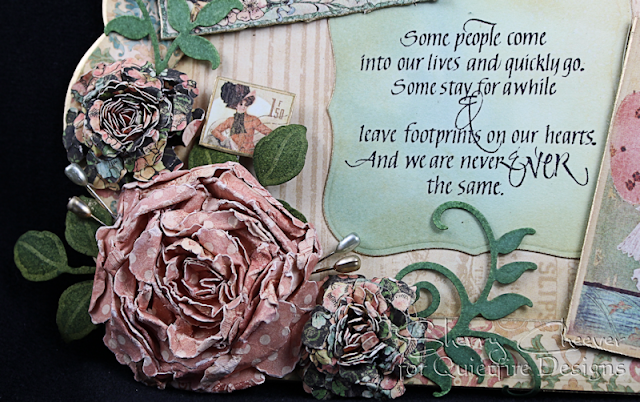 Using Spellbinders Grand Labels Eleven and some thin chipboard, this is what I came up with. There are many, many layers of chipboard layered on top of one another because I wanted to create an offset from the back panel. Once I had the panels die cut, they were trimmed at the base to be straight. The branches from Spellbinders S4-378 Cherry Blossoms were die cut from chipboard, painted with acrylic paint, and then layered from the back panel. 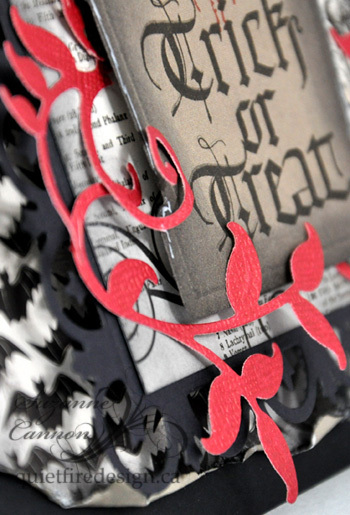 The sentiment from the Halloween Wicked Collection was embossed with Sparkle Black embossing powder, then die cut/embossed with Spellbinders S5-019 Labels Eight. Now here’s my favorite part . . . the tombstones! They were die cut from chipboard with Spellbinders S4-330 Nested Tombstones, painted with acrylic paint and assembled by layering the different sizes on top of one another. Mr. Bones is hanging with his friends Ima Goner, Barry A. Live and Izzy Dead! Some white silk flowers from my stash were spritzed with Spiced Marmalade and Black Soot, and then covered with Black Soot Distress Stickles. The fence was die cut/embossed with the border from Spellbinders S5-042 Fleur de Lis Doily Accents. Once labels were put on the little bottles, there were covered with Rock Candy Distress Crackle Paint. Love the cracked finish! A Chance to Win Quietfire Rubber Stamps! Hop right over to the Paper Crafts Connection Blog for a chance to win a selection of Quietfire Rubber Stamps! Designer Betsy Veldman has use our stamps to create a delightful Christmas project! Thanks Betsy! The deadline is this Friday. 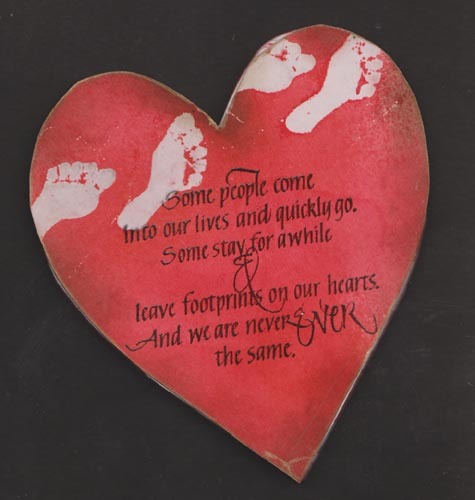 I drew and cut out some fun foam in the shape of bare feet and stamped onto my white cardstock using Perfect Medium and clear embossing. Sprayed Dylusions red spray color and a mini mister mixed with Distress "Barn Door", Perfect Pearls Gold and water. Dried. Ironed the clear embossing from feet between clean newsprint. Stamped the quote "Some people come into..." with Versafine Black Onyx and clear embossed. 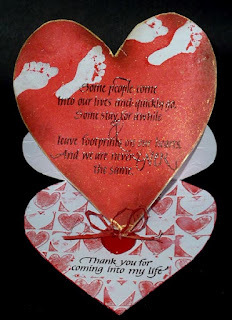 Cut out my heart shape using a Spellbinders heart as a guide and enlarging it slightly. Sponged some "Aged Mahogany" and "Walnut Stain" around the edges, then outlined with a Krylon gold leafing pen. 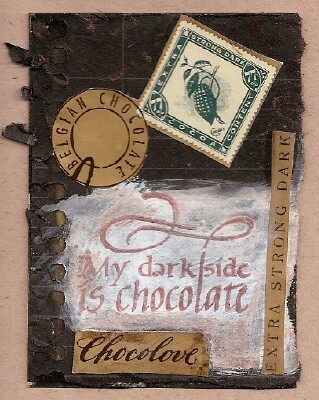 Stamped the inside sentiment with the black. Masked it with some tape. Placed my Cuttlebug Heart Block embossing folder where I wanted it, taped my card to it, then inked up the other part of the embossing folder with Barn Door, misted lightly with water, and pressed it closed, using my rubber mallet to emboss the design in the areas I wanted. Tied some red raffia on the red heart shaped button, then adhered it to the card as my stopper. 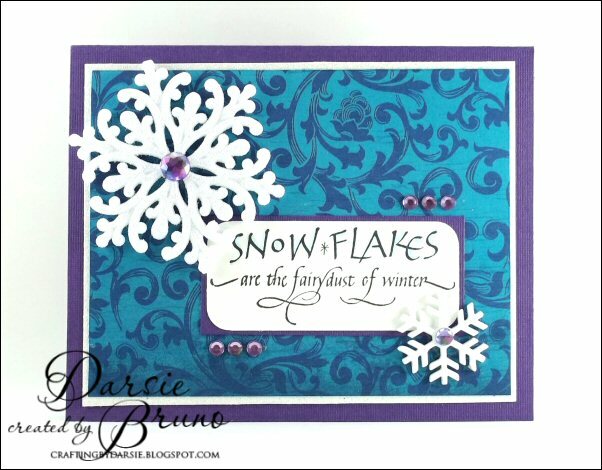 Today, I've created a simple card using the "Snowflakes are the Fairydust" stamp. This was an easy card to put together! With the hustle and bustle of the upcoming holiday season, getting your cards finished on time is a hard thing to do. Using gorgeous calligraphy sentiment stamps and pairing it with pretty holiday paper is a sure way to get them done quickly! Make sure you check out the entire line of stamps from Quietfire Design for the holiday season! Hi there, it's Suzanne today! Well, I didn't really plan to start Halloween yet, but the days are flying by and I've been wanting to use these new Spellbinder's Tombstones! So here they are. I stamped Trick or Treat on the paper using Versafine Onyx Black, then stamped the bat using Archival Vermillion, let dry, then die cut the tombstone. I really wanted to use the new paper and chose the skelton page to accompany the tombstone. The Fleur de Lis Rectangles seemed like the most "gothic" die I had (I'm sure I'll think of something else tomorrow....), so that was cut from black cardstock. I really couldn't decide which paper to use for the background. Bats.Spiders.Bats.Spiders.....so I used them both, with each decorated paper covering half the card. It all just looked too nice and neat, so it was time to grunge it up. Time to tear some paper! I didn't think you could ever have too much black. But this was looking pretty plain. I used a white Gel Extreme to outline the tombstone. (I resisted making it look like a little birdie had been sitting on it....) And a little blood red garden foliage seemed to perk it right up! The Halloween Wicked Collection may be found here! Hi Everyone! This is Holly and I have a birthday card for you today. Can we have too many birthday cards? I don't think so. This one has a bit of a distressed look with a clean and simple finish. I began by embossing white card stock with the Debonair Edges folder. I clear embossed the raised design using Versamark ink and clear embossing powder, then cut along the outside edge of the embossing to create the square. I inked up Happy Birthday first with Versamark ink, then with Brushed Corduroy Distress Ink, stamped it in the center square and clear embossed. You can emboss distress inks alone but I wanted total coverage with the embossing powder, so added in the Versamark ink. 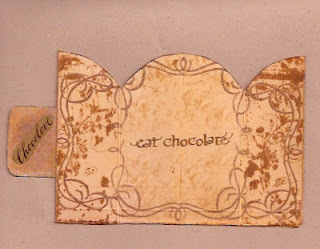 I sponged on more Distress Inks- Shabby Shutters, Victorian Velvet and Brushed Corduroy- covering all the card stock that wasn't clear embossed. A quick wipe with a tissue removed any ink from the embossing, allowing it to 'pop'. The square was then attached to the white card base and a few bits of bling were added. Easy peasy! I love this Happy Birthday stamp and all the ones that go with it. I hope you do too. Thank you for looking at my project today. Hi Y’all, Monica here today. If you haven’t heard, Quietfire Design has a bunch of new stamps out. I used my favorite for today’s card. To create the backgrounds for this card I used Distress ReInkers (Squeezed Lemonade, Shaded Lilac, Peacock Feathers, Worn Lipstick)and Mini Misters. Perfect Pearls was added to Worn Lipstick for a bit of shimmer. On the base card and quote layer I used the Worn Lipstick mixture sparingly. For the middle layer I used it for the main color and added Shaded Lilac and Peacock Feathers on top. Distress Stickles Rock Candy, was rubbed around edging of the middle layer. The layers were added using pop dots for dimension. I love this quote so kept the card simple to showcase the stamp. Thanks for looking. Happy Friday Every! Thank you for stopping by my very first blog post here at the Quietfire Creations Blog. A special thanks to Suzanne the mind behind these amazing stamp. This birthday card shown above was created with one of the new stamp sets that Quietfire has just released, Happy Family Days Stamp Set #5909, just look at those curvy swirls and did you notice this stamp set matches Spellbinders S4-161 Labels One, you cam also find all of your Spellbinders die templates right here too at Quietfire. I stamped the Family Days Stamp Set using the Happy Birthday sentiment on my My Minds Eye Indie Chic pattern paper, then die cut it using the Spellbinders Label One. 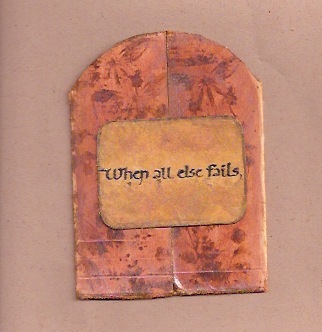 Once it was cut and embossed I mounted it on a piece of Want2Scraps Label One Nestaboard, and inked the edges. I decided to embellish my birthday card with some simple hand stitching, everyone knows I love to sew on just about every project I create so this one was no exception! I used some DMC Floss and created my own stitching pattern and there you have it, a birthday card. So I hope you have enjoyed my first post here and remember to check out all of the amazing stamps at Quietfire Designs and be prepared you are going to want them all, I know I do. Until next time, Crafty Hugs, Terre! Robyn here today and excited to be posting as a member of the Quietfire Design Team introducing the Summer rubber-anything that keeps the summer coming- I'm for it! to transform this jar of chocolate cookies int easy summer gifts. A Gift for A Good Friend! Good morning! Today it’s my turn to post the Quietfire Creations. Please bear with me as I’m not familiar with Blogger and I’ll be learning as we go along. For my project for today’s post, I made a wall hanging using Graphic 45 A Ladies Diary Collection and Spellbinders die templates. The sentiment I chose to work with, Some People Come Into Our Lives, makes me think of a good friends, so I thought this might make a nice gift for a friend. The frame was made with Grand Labels Eleven and the sentiment was die cut/embossed from watercolor paper with Labels One. The flowers were made with Blossom Five and the smaller flowers from Bitty Blossoms. The leaves were die cut/embossed from Foliage and Foliage Two. That’s all for me today. Thanks for stopping by! 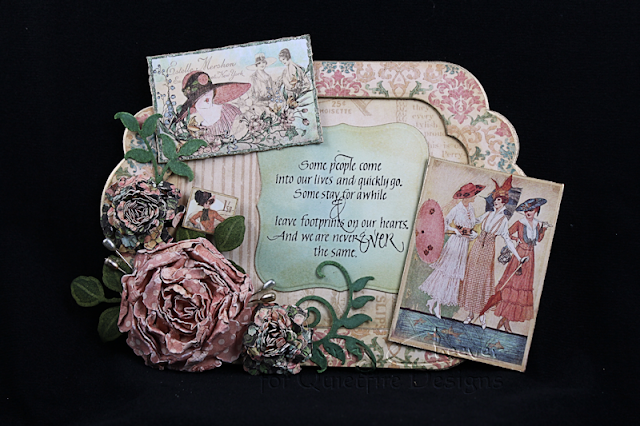 My first post on the Quietfire Creations blog using one of the latest from the Summer 2012 release of stamps. I'm using the "We cannot tell the Precise Moment" companion set. Love these stamps, and now I'm doing the insides too... I've paired it up with Spellbinders Blossom 3 die set. To see more details and descriptions etc, please check out my blog post.